As with any great event in life, it is important that you extend a proper wedding invitation to those guests who are invited. Unlike just a casual, “Hey, wanna hang out?” you now are forced into creating a formal note that is requesting the presence of so-and-so to be present on your special day. 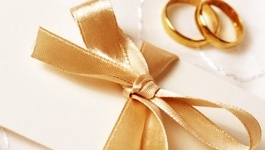 Your wedding invitation should be a reflection of you and your husband-to-be, and how you two are recognized as a couple. Who says that you need to go with the white card paper, flowers and the formal speech between the cover of the card? You can really write the wedding invitation any darn way you like, must as long as it is a reflection of you both. Having your wedding invitations printed will cost exponentially more than if you were to make them yourself, but if you simply do not have the time to spare or if the time spent creating those invitations isn’t worth the expense, then it you should consider having them printed. How do you Word a Wedding Invitation? Again, the wording is really up to you. No one really expects that you write out a wedding invitation formally anymore, and they actually appreciate the change of pace if you do choose to address the invitation differently than most. TIP: If there is an estranged parent in the family, you do not need to feel obligated to include them. The same rule goes for any step parents, should you not get along with them so well. In this modern day in age where everyone is promoting an increased “paperless” society, it’s no wonder that more brides and grooms are thinking about paperless, technological wedding invitations. Not only that, but it is often free. For all of you who have tech-savvy friends and family, sending out e-Invites or “eVites” for your wedding is perfectly acceptable substitute to the old fashioned way of mailing out an invitation. It will save you hundreds of dollars, it can be quickly referenced to, and let’s be honest there: most people toss any wedding invitation they receive. This way the invitation will simply be emptied from some cyber “deleted” folder or trash bin without leaving an impact upon the earth. Most sites that allow the functionality to create an online wedding invitation will also let you create or set up a wedding site, free of charge! So you can even have more information provided to your guests than any wedding invitation, and it’s easily view any where at any time that they have an Internet connection.